Back yards. Side yards. Patios. Â What does your outdoor space look like? Â How do you use it? Now and again we have buyers that really want a back yard. Â As a homeowner, and an owner of a SummerHill townhome, I understand the allure of a back yard. Â It is a place that you can hang out, yet I know that for us (my husband and me), our two little balconies in Belmont are just right for both of us to maintain because we both work. 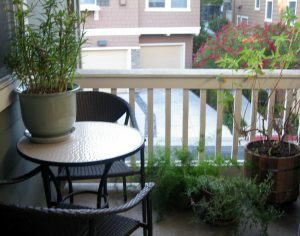 We like to enjoy a meal on the balcony during the summer and this little bistro table is just perfect! Â Plus a few decorative plants for ambiance. Weâ€™ve maximized our outdoor space as you can see in the photos. Â I like to garden and have found that container gardening suits me just fine. Â We’re looking forward to tomatoes and meyer lemons from our garden. 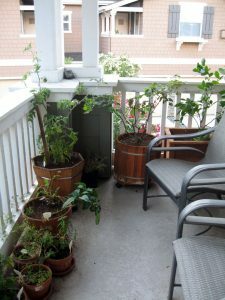 Our side balcony - check out the tomato plant in the left corner and a meyer lemon tree in the right corner plus a couple of chairs to sit back and enjoy evening sun. There are benefits and compromises with every home style – itâ€™s all about determining what works for your family. There are ways that you can redefine outdoor space that you have to fit your lifestyle. Have a patio? Â Add some containers and plant your very own herb garden. Â Nothing takes better in home cooking than a bit of fresh parsley or thyme, and they are very easy to grow. Have a back yard with a long path next to the house? Â Think about a small putting green with faux grass to practice golf. Â And, work with a landscaper to plan eco-friendly garden solutions. Now you may be wondering why all new homes donâ€™t have the same outdoor features? Â Our land and development team (the SummerHill folks that plan out the communities) work closely with teams in each city to ensure that weâ€™re meeting the specific city development plans, including density. Â Density is the amount of units that will fit per acre on a site. Â This may mean that lots are smaller or townhomes or condos are built to be able to meet the density plans that the City envisions for the project. How do you use your outdoor space? Â Are you already a SummerHill homeowner or a fan of SummerHill? Â Share some photos of how you use your outdoor space on our Facebook page or write us a comment below.